Level 1-6 is the sixth level of Mario Toy Company in Mario vs. Donkey Kong. The high score for this level is 27500. 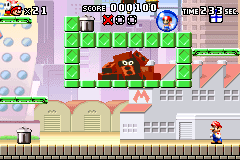 The level starts with a cinematic showing Mario doing a Handstand to block falling cement blocks. The player starts under a "Help" block showing the player how to perform a Handstand Jump, which is needed in order to jump up the platforms. 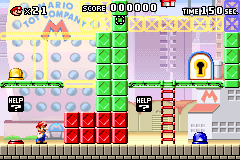 Activating the yellow Color Switch on the upper platform will cause a ladder to appear, at the top of which is another "Help" block showing the player how to perform a Handstand Double Jump that needs to be utilized in order to jump up the next platform. At the far right side of the next platforms is a blue Color Switch, which will create a ladder upon activation. After climbing down, the player then needs to activate the yellow Color Switch followed by the red Color Switch in order to fall to the platform with the locked door. Climbing down the ladder, the player will find a "Help" block telling the player that Handstands prevent damage from falling bricks, which can be utilized against the Brickman ahead. Pressing the blue Color Switch, the player has to make it past the Brickman to collect the Key, use the Springboards, and press the yellow then the red Color Switches again to return to the locked door. In the second area, the player starts next to another Brickman. At the far left are two "Help" blocks showing how to toss items up and perform a Backflip, both can be done with the Trash Can and getting onto the above platform. The player can then use the Trash Can to climb the next platform or do a Handstand Jump if the Trash Can was used to defeat the Shy Guy. By using a Springboard, the player can reach some platforms with a Trash Can and a Shy Guy. Across the gap is an enemy Trash Can and a couple of Oils, along with a Hammer that can be used to defeat them. Between the two Oils is the Mini Mario. Red: In the first area, above the locked door. The yellow Color Switch needs to be activated in order to collect it. Yellow: In the second area, before the Mini Mario. Blue: In the second area, after the Mini Mario. This page was last edited on April 14, 2019, at 15:40.